Synopsis: Twins come back into each other's life after an almost tragic accident. Siblings have a special bond all their own. No matter what happens, siblings seem to find their way back to each other for support or just an ear to talk to. 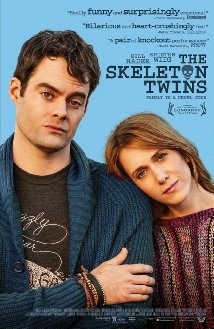 THE SKELETON TWINS follows twins (Kristen Wiig and Bill Hader) as a personal tragedy brings them together, and all of their problems are brought out in the open. Maggie and Milo were inseparable as children, but then their father killed himself and their mother left, which sent these two into lifelong struggle to find happiness. The pair haven't spoken in ten years until Milo decides to take his life but ends up botching the suicide. Maggie has toyed the idea of suicide as well, but a phone call about Milo stops her. This brings Maggie back into his life, and Milo uproots from LA and moves back home to New York. Maggie and Milo pretty much pick up where they left off. There are a few items to catch up on (Maggie is married now, Milo is a struggling actor with no prospects), but they act as if almost no time has passed. The longer Milo stays, the more their past and present demons begin to surface. Even though they have lost touch over the years, they have parallel stories. Their father passing was the catalyst for their messed up lives, and as much as they try, they can't seem to escape the cycle. Wiig and Hader completely make this film. The script itself is a tad predictable, but their performances are so rich, you forget about the plot and just focus on their characters. The highlights of the film are when Wiig and Hader have scenes together. There are two scenes inparticular where the director let their SNL past shine through. Their chemistry is wonderful, and it's easy to see how much they love working together both on and off screen. Then, they're able to completely flip sides and pull out dramatic scenes which I wasn't sure would work given their comedic past, but they pull it off brilliantly. Wiig especially gives a fantastic performance, and she's making her mark as a dramatic actress. On a technical level, the film is very well shot and directed. Director Craig Johnson, in only his second feature, is able to draw fantastic and nuanced dramatic performances out of these two comedians. This film treads the line of being too cliche with some of the story arcs, but by the end, we're so invested in these characters, most of the flaws can be forgiven. When comedians try to break into "serious acting," it can often be disastrous. However, with Johnson's smart direction and Wiig and Hader's clearly untapped dramatic talent, this film ended up rising above and being better than it had any right to be.